“The small, rolling drum-like device called the Waterotor, created by Fred Ferguson, CEO of Waterotor Energy Technologies, is capable of harnessing energy from water currents moving at just one to six miles per hour and converting into electricity. The Waterotor is ideal for the world’s energy requirement through renewable way because it transforms the energy in slow-moving rivers and ocean currents to electrical power, thereby making a continual stream of low-cost electricity available 24 hours a day to people and businesses not connected to a central grid. This unique hydro-turbine is the result of a multiyear R&D program conducted under the leadership of renowned technologist Fred Ferguson, recipient of numerous awards and recognition for his work in the aerospace and energy fields. Waterotor Energy Technologies Inc., is an Ottawa, Ontario, Canada, based company incorporated in late 2010. The Notable aspects are that the Waterotor stands alone as a technology that simplifies the extraction of a high level of energy from very slow moving water. The technology can be scaled from small units to ocean sized rotors. Output estimates of electricity from water moving at 4 mph equates to a few cents per kilowatt hour. This technology has gone through multi-million dollar development and is now being commercialized for mass deliverables. Waterotor is unique in that its highly developed design can extract a very high level of energy (Coefficient of Power) from very slow flowing water. 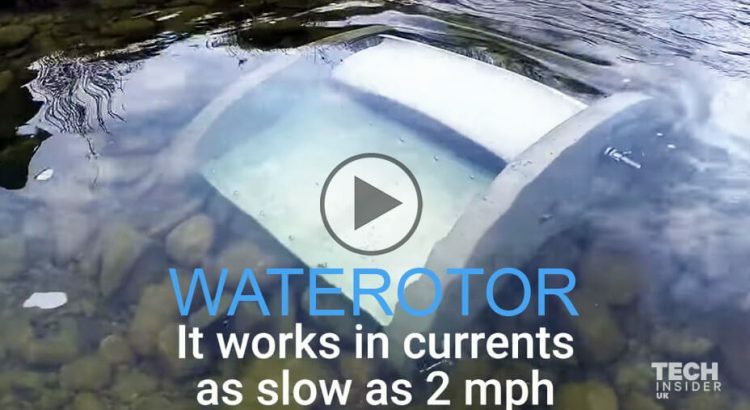 Waterotor stands alone by extracting 30 % of slow moving water energy and converting this energy to electricity at these very slow water flow speeds. No other water extraction device can effectively and cost efficiently operate in a flow speed of 4 mph ‘typically found in ocean currents and many river systems’. Also, the 30 % extraction rate is a constant from flow speeds as low as 1 mph. Fundamental to the invention is the way in which the Waterotor achieves maximum torque resulting in a high coefficient of power. This relates directly to power vs. size vs. water flow speed. Ferguson’s early inventive understanding of the combined components and features regarding the W.E.T.